Horrible Bosses, the farcical comedy from director Seth Gordon, is a surprise, though possibly not of the pleasant kind. With an ‘A’ list cast including Jason Bateman, Charlie Day, Jason Sudeikis, Kevin Spacey, Jennifer Aniston, Colin Farrell, Jamie Fox and Donald Sutherland, the humorous elements are unfortunately more ‘Z’ list. Nick Hendricks, Dale Arbus and Kurt Buckman (Bateman, Day and Sudeikis) are three friends who though enjoying their jobs, hate their bosses (played by Spacey, Aniston and Farrell). Drowning their sorrows after a particularly bad day at work, the men hatch a plan to rid themselves of their respective nemesis’. However in the cold dawn of the next day their idea doesn’t seem quite so hot, which is unfortunate as they may already have gone too far. 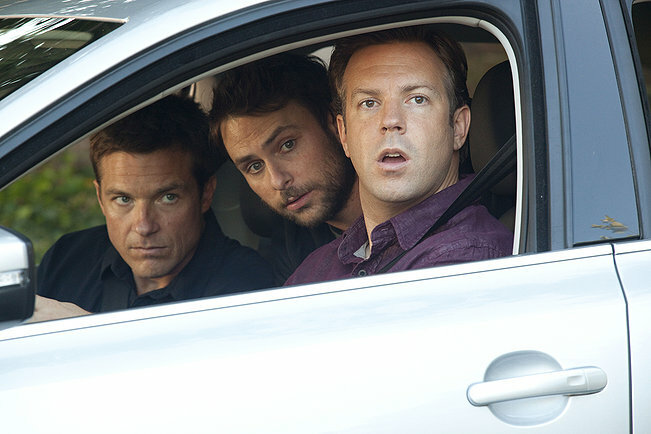 Horrible Bosses‘ ‘toilet humour’, though at times funny, is neither clever nor sophisticated. There’s been a trend within recent years for comedy, aimed mainly towards men, which takes the approach of a laddish adolescent. Horrible Bosses, and similarly bawdy films such as The Hangover (2009), may be amusing after a few pints, but leave a sour taste once you’re sober. The aforementioned surprise is Aniston. Since finishing Friends she has tried, like the rest of the cast, to lay the show’s ghost to rest with varying degrees of success. Her venture into straight drama in the Good Girl (2002) received critical plaudits, whilst her role in the thriller Derailed (2005) was memorable proving that America’s ‘Miss Goody Goody’ could actually act. However for the most she has stuck to what she does best, the safe ground of rom-coms. And this, one suspects, is the reason she took on the role Dr Harris in Horrible Bosses. The fouled mouthed nymphomaniac dentist is so at odds with her public image, that she probably jumped at the opportunity to be ‘edgy’. However, unlike the male cast members such as Farrell for whom risqué humour is often the norm, it sits uncomfortably with Aniston. The truth is whether she likes it or not, the public expect her clean cut and wholesome, and unfortunately one feels it might be too late for them to change their conception of her. One thing in the film’s favour is its frenetic pace which fortunately leaves you little time to linger on it’s shortcomings. Just as well, as otherwise you too might be driven to murder.